I received so many compliments and questions about my manicure from this post, that I decided to share how to do it yourself with you all. It looks very dressy and can be worn with all shades of pastels and neutrals. Plus, this nail art design is suitable for very short nails (like mine at the moment). 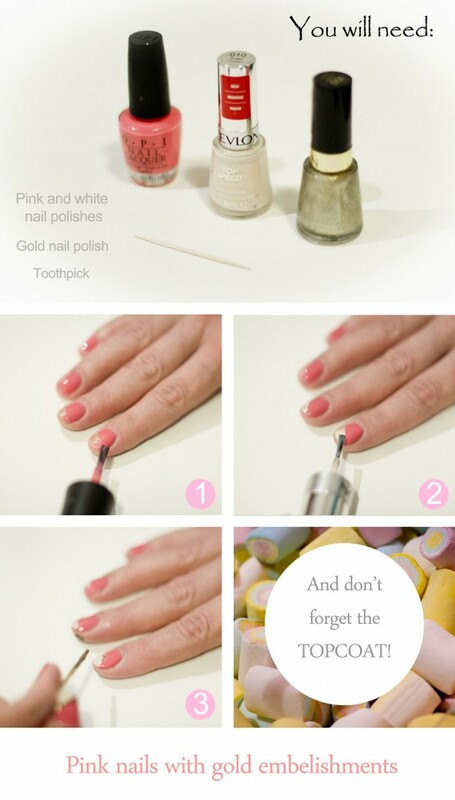 Of course, as with all of my other DIY manicures, this pink nail art is really easy to re-create. 1. 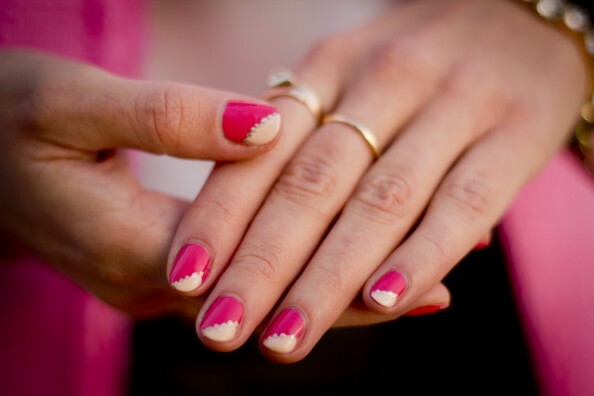 Apply one coat of light pink nail polish on each nail leaving a diagonal area at the tip uncovered and let it dry. Use sticky tape as a mask to get a precise line. I used OPI Elephantastic Pink NL 142 nail polish. 2. Paint white nail polish over the unpainted tips keeping the same angle. I used Revlon 010 Sheer Cotton. 3. Use toothpick to apply gold dots of nail polish along the line (Revlon 925 Gold Coins). Let it dry and apply the topcoat. What I love about this type of DIY nail art that there are endless variations of patterns and colour combinations to suit any look. I love this look, super cute too! I was inspired by @higasaurus on instagram last night; and now have half of my nail in lilac and the other half clear based chunks of gold glitter. It’s so fun to do something different with your nails! Really cute! I’m never good at nail art but this looks easy enough! I loveee it! Beautiful colour combination and with my horribly short nails at the moment, it is perfect. It looks very nice and I like the colors you chose. Very pretty Maria, one of the nicest ones I’ve seen!